The 257 comes from the factory with a two-snap hand grip attached to the carry handles. This serves two purposes. First, it distributes heavier loads across your hand to make carrying the bag very comfortable. 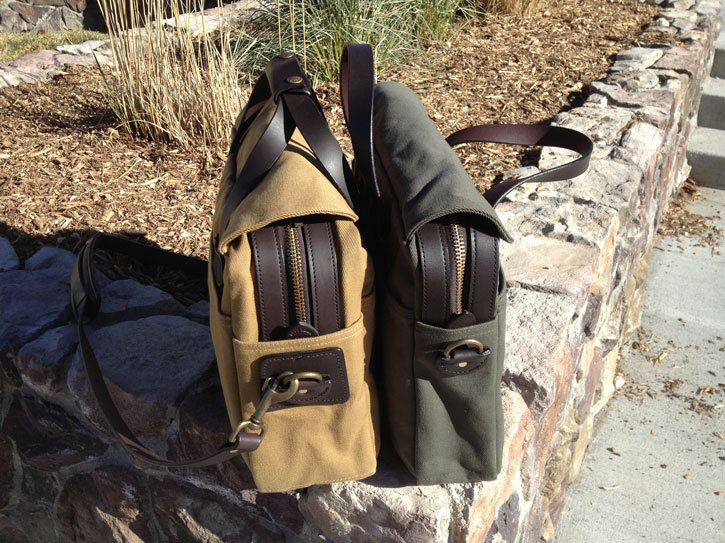 Second, it keeps the handles neatly together when you place the bag down or are carrying it with the shoulder strap. 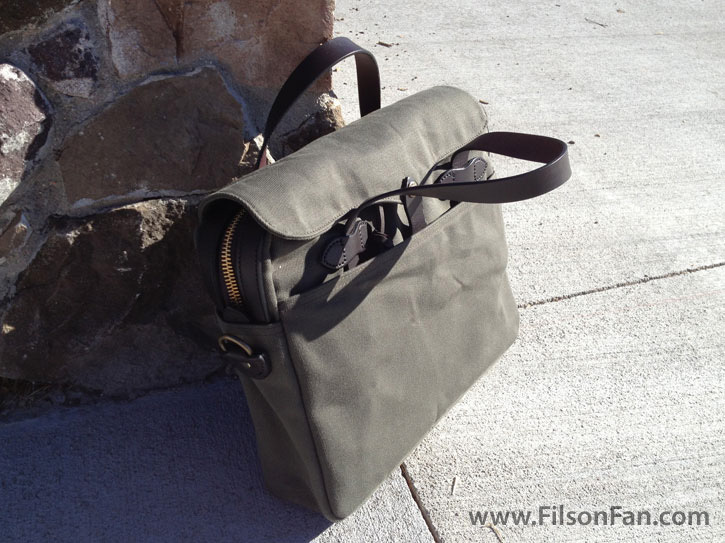 The 256 does not include the hand grip, but Filson will install it for you for $20, so if it is important to you, there is a work-around. I am in the minority, but I definitely prefer the 256 without the hand grip. I find that the two bare handles are very comfortable with my typical load and I like the casual character of the floppy handles as they break in. 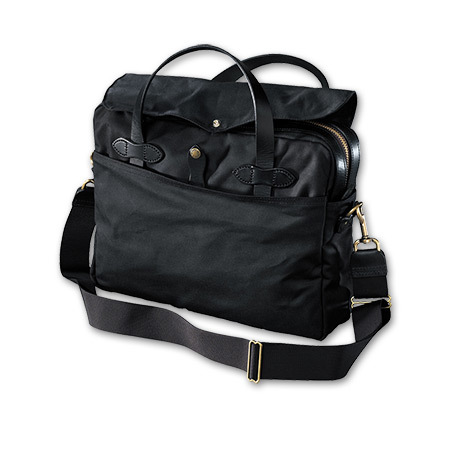 In addition, it makes access to the main compartment easier if you are constantly in and out of your bag. 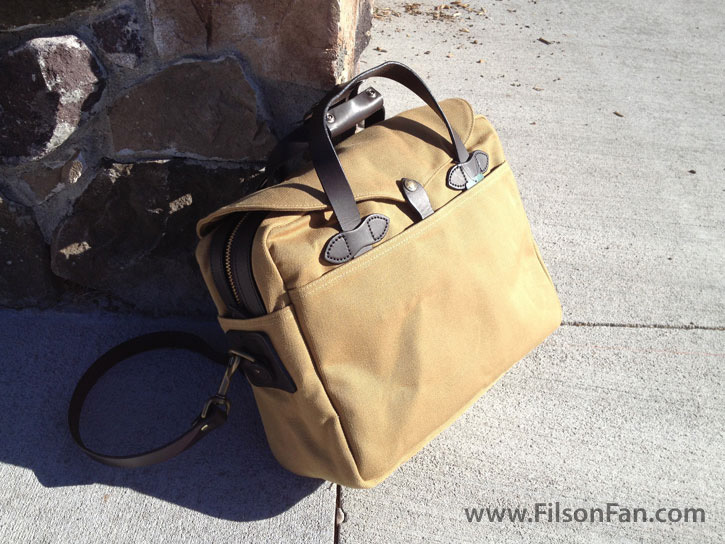 The 256 has the shoulder strap attachment point stitched directly to the canvas. 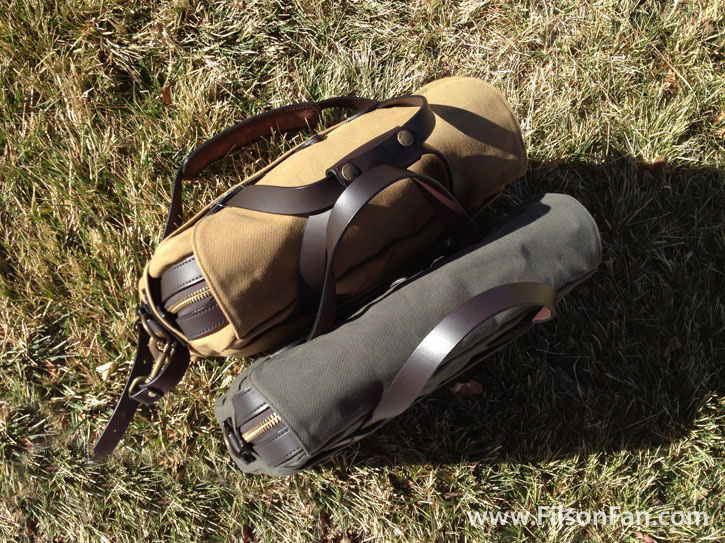 Whereas, the 257 uses a large leather baseplate to connect the attachment point to the bag. This will spread the load over a larger surface area and should allow the bag to handle very heavy loads slightly better. The 257 has a wider base and will stand up on its own. The 256 will need to be leaned against a desk or a chair because of its narrow base. In person, the 257 definitely feels bigger and bulkier than the 256. 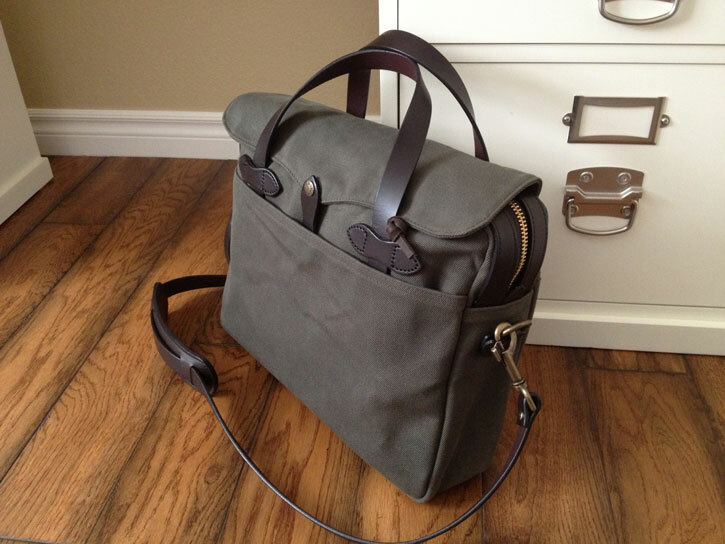 It only weighs about three ounces more, but overall it feels like you are carrying around considerably more bag. Whether this is a good or bad thing is entirely subjective. If you are a student and carry lots of textbooks or have a more sizeable laptop with a charger brick and want to carry a water bottle, a jacket, etc., then the bulkier 257 may be just what the doctor ordered. It is hard to truly understand how different the two bags feel without handling them in person, but you can get a sense of the size difference in this picture. The inside of the 256 is fairly basic. 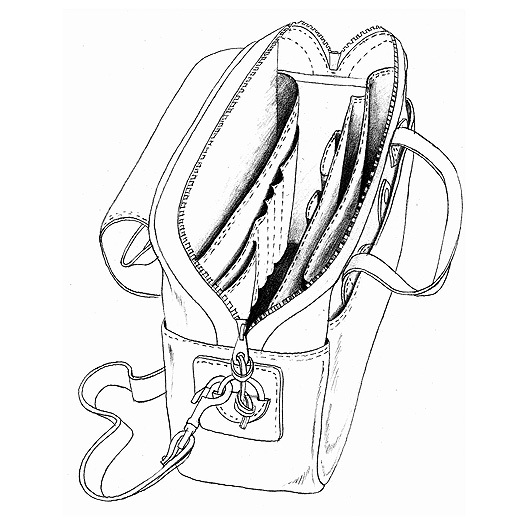 The bag has a spacious main compartment sandwiched between two full length interior pockets, one of which has six smaller pockets (of various sizes) sewn onto it for pens, business cards, calculators, cell phones, etc. 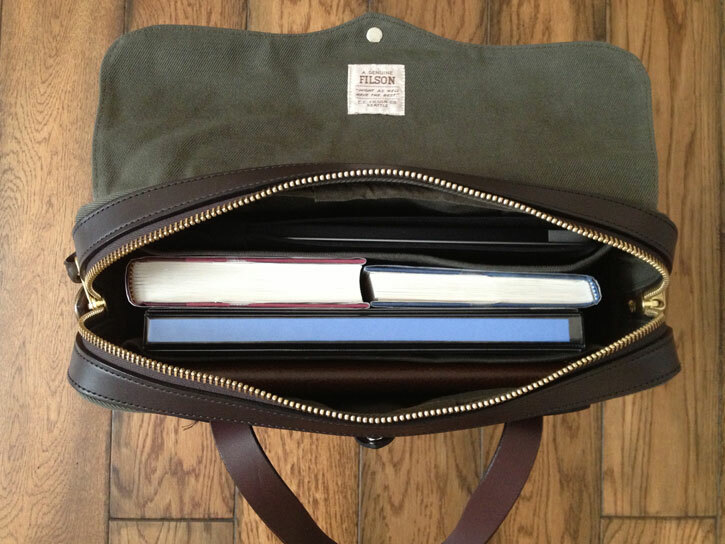 The full length interior pockets are perfectly suited for a small laptop (13″ MacBook Air), a legal pad holder or an iPad. 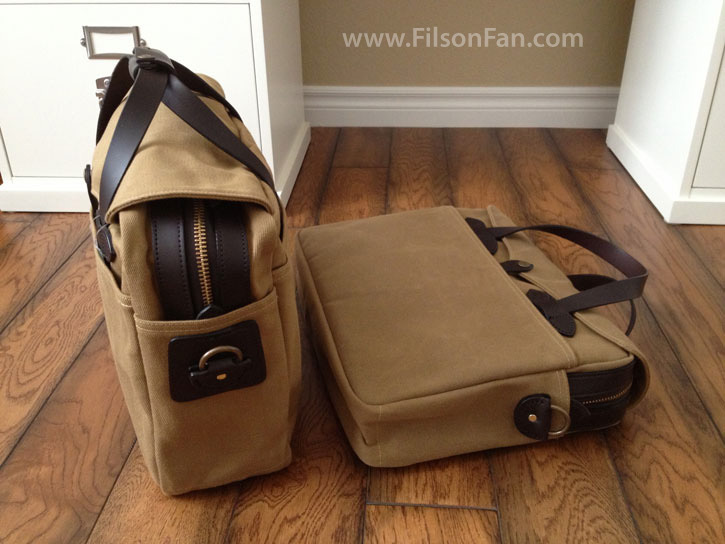 If you want to use a 15″ laptop with this bag, you will need to put it in the main compartment. The 257 is a little more complex inside. 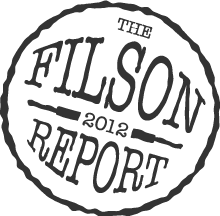 The following schematic (from the Filson web site) is the best representation of the interior. 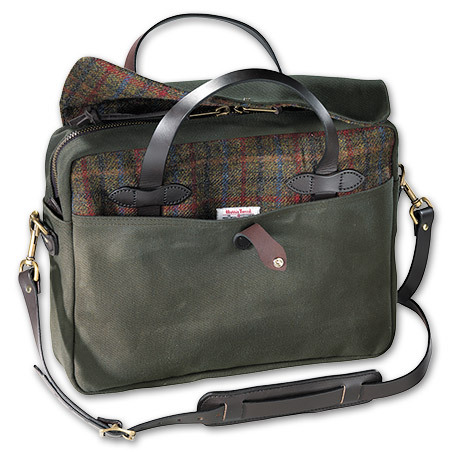 It starts with the basic 256 layout and adds a large, full-length laptop divider (which is not secured to the bottom of the bag) and three additional large sleeve pockets sewn to the inside of the interior pocket. I find both layouts to have certain advantages. 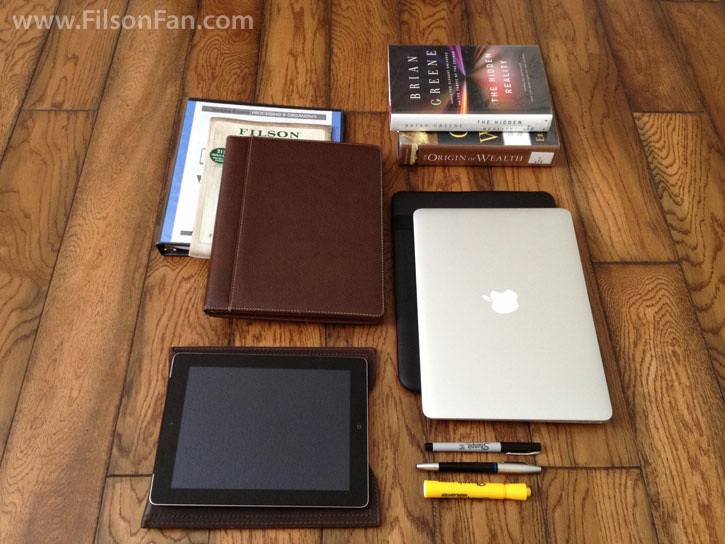 The 256 is simpler and cleaner and provides all the essential storage that I need for most days. While the 257 includes more pockets and dividers, they do intrude into the interior space a bit if you don’t need so much partitioning. Because I use a 13″ MacBook Air, which easily fits in the interior side pocket, I often wish that the 257 did not have the extra computer divider so I could make better use of the main compartment. If you use a 15″ MacBook, you may need to put it in the main compartment anyway so the laptop divider may be rendered superfluous. 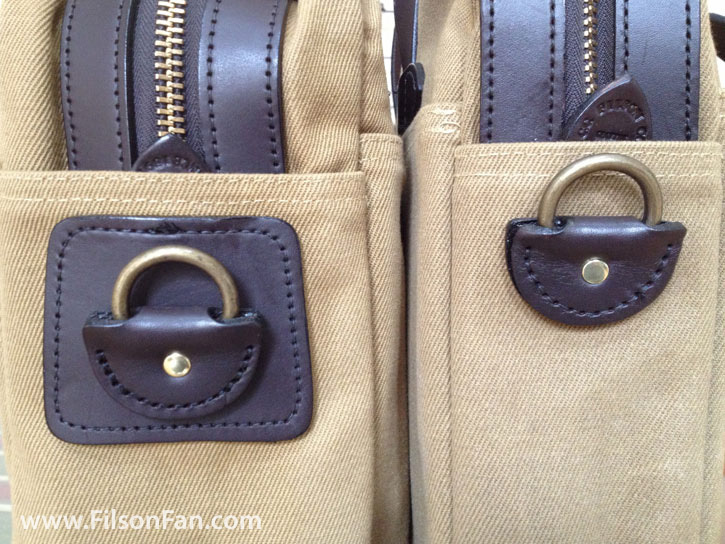 For many years, the three sleeve pockets on the inside of the 257 did not have a sewn bottom, meaning that they are designed to secure larger cargo, but cannot be used as conventional pockets to hold smaller items. I actually love the sleeve design because I am able to fit two 16 oz Nalgene water bottles and use the remaining sleeve for my laptop accessories. 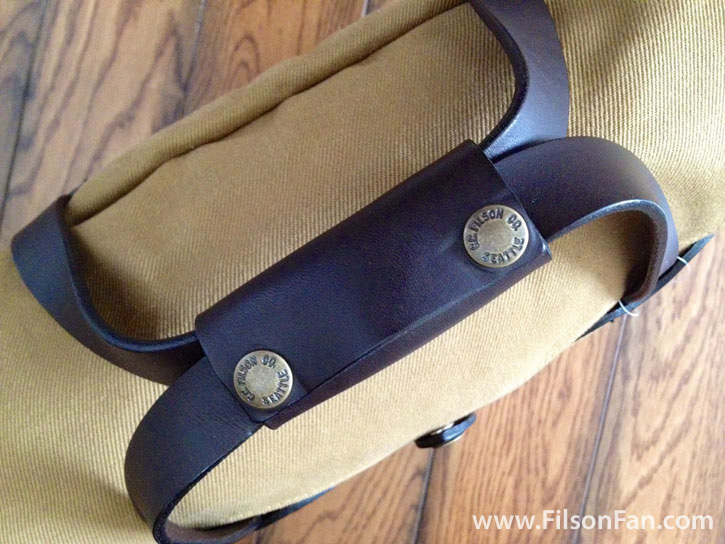 In the last few months, I have read reports that Filson has changed the design (in response to customer demand) and is now sewing across the bottom to create closed pockets. This change is definitely something to be aware of so that you can be sure to get the layout that suits you best. My 257 was purchased locally one month ago with the open sleeves and it is my preferred layout. 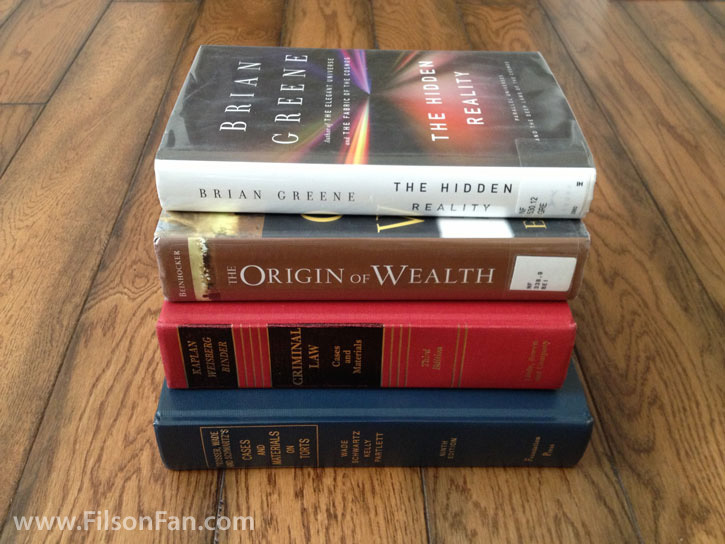 WHAT WILL THESE CASES HOLD? You may be surprised how much the 256 Original Briefcase actually holds (I certainly was). Here is a visual representation of how I use the bags on a daily basis. Here it is full and ready for the day.. 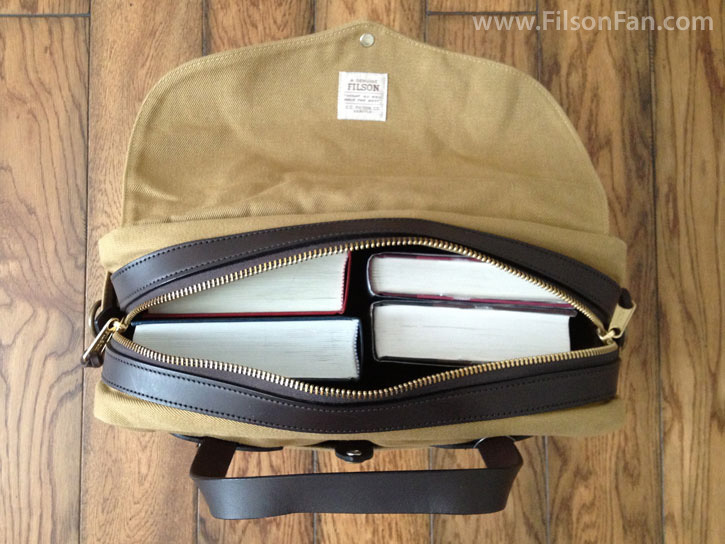 If you need to carry heavy textbooks (or more than a couple hardcover books), then the 257 may be a better choice. I would definitely recommend the 257 for college/graduate students. Bottom Line: both briefcases are excellent, but unless you have a specific and compelling reason for the extra size/bulk, choose the 256.
are having trouble deciding…the 256 is a better choice for most people. 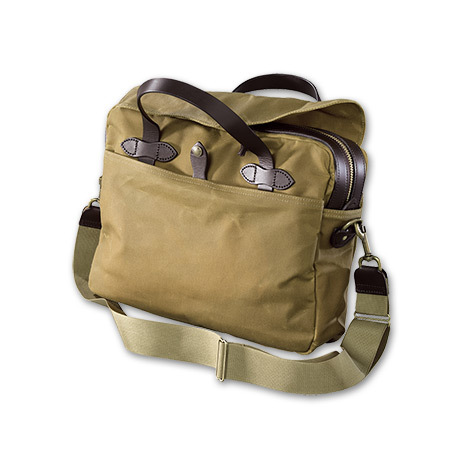 you work in the field and need to carry tools, lunch, water, or specialized equipment in addition to a computer and some paperwork.